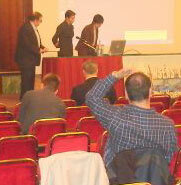 We would like to thank each of you for the really great WSEAS Congress in Venice (Venezia). "Living in a fast technologically growing world, it is becoming more and more difficult trying to follow the development of new technologies, new ideas and new mathematical/computerized methods. WSEAS, a pioneer scientific organization, has been always on the front line of scientific research and will continue by providing constantly the highest technical briefing as well as limitless opportunities of participation in research courses to its members and friends. WSEAS has nothing to feel disadvantageous compared with any international scientific organization since its worldwide recognition is established". During the Banquet, we had the pleasure to enjoy a typical Venezian Show called "Lezioni di Minuetto" tha the Organizers arranged specially for the WSEAS attendees. During this banquet, the participants were taught the so-called Minuet lessons: A group of professional dancers in period costume and a Master of Ceremonies will give a demonstration of the dances typical of Venetian parties during the 18th century and later involved the guests, teaching them the fundamental steps to the notes of Boccherini's famous Minuet. After that, each of our participants danced with the artists in a wonderful unforgettable night of November 21. The live Orchestra played also modern music and also classic for the minuet. The Banquet was really superb with 40 different plates and local delicacies (November 21, 2005). The genuine Venetian artists took us back using their magic "machine of time" to the 14th and 15th century using music, dance and dressing from the Dogis' Era ( Dogis were the Leaders the of the Venezian Empire which was a Naval Empire that controlled almost all the mediterranean sea with the Venice as its Center). The first human settlements on the Venice Lagoon islands date back to the 5th and 6th centuries, when the inhabitants from the mainland came to this semi-swamp area to escape the barbaric invasions that followed the fall of the Roman Empire. The populations coming from mainland Venice settled in the lagoon, fighting as hard as they could to survive: little by little this group of pieces of land surrounded by water took on the semblance of a real town, a town that was so unique and special that it would become the only one of its kind in the world. The new inhabitants built several rafts of various sizes, supported by strong wooden poles that were fixed to the underside. The rafts were connected to each other with wooden walkways and houses, buildings and monuments were then built on them. When Venice had a big enough population to begin to deserve the title of city, it was then annexed to the Byzantine Empire, while maintaining its own independence. In 697, Venice elected its first Doge, giving life to a new government: the Dogado (Maritime Empire). However, the event that finally made Venice’s name in the world took place in 828, when two enterprising Venetian merchants stole the Apostle Mark’s body from Alessandria in Egypt, and secretly transported it to Venice. A huge church, consecrated in 1094, was built to house the remains of the Saint, who then became the patron saint of the city: the Basilica of San Marco. Since the very beginning, Venice showed strong inclinations towards trade. This increased to the point that at the end of the 11th century, the city set up close trading connections with Byzantium. This was the start of the Republic of Venice, which was finally consecrated in 1202 through the 4th crusade that saw the conquering of Byzantium and then the islands in the Aegean and Ionian Seas. The eastern city was sacked and the booty was taken to Venice, where it was used to decorate churches and palaces. The four bronze horses that still adorn the main facade of the Basilica of San Marco were also part of that booty. After the 4th crusade, Venice gained a strong political role due to the fact that it now controlled a large part of the Mediterranean and it also increased its military power and its trading. The city’s historical rivalry with Genoa exploded under the form of four wars that were fought one after the other until a truce was finally agreed at the end of 1381, when Venice beat Genoa in the famous Battle of Chioggia (1380). Venice then realized that it was necessary for the city to have bases on the mainland too and began to expand towards Padua, Vicenza, Verona, Brescia and Bergamo. Venice’s prestige grew at the same rate as the increase in the land it controlled and was thus given the name of Serenissima. However, danger was round the corner: the Serenissima was so busy expanding on the mainland that it did not realize that the Turks’ power was expanding rapidly, to the point where they took over Constantinople (Byzantium) and some cities on the Greek and Albanian coastlines. The League of Cambrai was founded in 1508: this was a sort of coalition against Venice which most of the European powers joined. Venice managed to maintain some of its land after seven years of war, but it lost its control over the Mediterranean. In the 17th century, the Serenissima had to give up Crete, one of its historical lands and the whole of the Peloponnesus area to the Turkish Empire. In the period that followed, Venice’s political power was seriously damaged but there was a considerable increase of the arts and literature in the city, which gave rise to the creation of works of art by Tiepolo, Pietro Longhi and Canova and to theatre plays by Carlo Goldoni. In 1797, Napoleone Bonaparte conquered Venice, and sacked the whole area, just as he did in the rest of the country. A short while later the Emperor handed over the city to Austria, a ruler that was never accepted by the Venetians: in 1848, the Austrians were run out of the city by a group led by Daniele Manin, and the second Republic of Venice was proclaimed. This new republic did not last for long, however, as Venice was annexed to the new Kingdom of Italy in 1866. Abstract: In the context of Global Warming, the identification of those Land Management Systems that exhibit a high soil Carbon sequestration capacity, is a hot issue, especially in vulnerable ecosystems in developing countries, e.g. in tropical Latin America. Mathematical modeling is an essential tool in the necessary extrapolation of field experimental results in space and time. The precede example is a global climatic model using a 10 x 10 Km mesh in size today thanks to advanced supercomputers. As a very first step forward, I tessellate the Earth surface by 9 along the latitude, and 10 along the longitude. supply and demand by regional bases and obtain an interest regional unevenness. food supply to present at EED'07. Abstract: A simple mathematical model is proposed to study the influence of cell fission on transport. The model describes fractional tumor development, which is a one dimensional continuous time random walk (CTRW). A chemotherapy influence on the CTRW is studied. We find a condition when chemotherapy compensates cell proliferation and leads to either a fractional transport with a conservation of a number of cells or a stationary solution which describes time independent localization of cancer development. A specific feature of the analysis is cell diffusion in a periodic potential. This can model, e.g., metastasis cell transport along spinal column, where vertebrae make a periodic potential. Abstract: In this contribution we show the implementation of an adapted CFD code, developed by the University of Karlsruhe (Germany) and a mesoscale air quality modelling system composed by MM5 (PSU/NCAR) and CMAQ (EPA, US) and an emission model EMIMO, developed by the Technical University of Madrid (UPM). The system included a cellular automata model, CAMO, developed by UPM as part of the traffic emission system in order to accommodate the high spatial and temporal resolution emission datasets which are required by the CFD model. The CFD and emission system is called MICROSYS. The mesoscale meteorological and air quality dispersion model provides the boundary and initial conditions for MICROSYS. Different scenarios have been tested based on the reduction of traffic cars and increase of public transportation. The results show that the MICROSYS and the mesoscale air quality modelling system provide detailed and sensitive results to the different scenarios. The results show that the system can be used for analyzing many different situations in urban environment with a high level of detail and could be used as a management tool for air quality impact studies at urban level. Abstract: Collaboration involves a different approach to business – focused on managing business relationships between people, within or without groups, and within and between organizations. Collaborative enterprises differ from other business in a number of ways and collaborative working needs to be simultaneously a business philosophy, strategy and operational working. Effective collaboration unlocks the potential of the collective knowledge and intellectual capital of the organization and its networks of business partners, suppliers and customers. At the core of true collaboration is the ability to share and catalog knowledge, ideas, standards, best practices, and lessons learned and to be able to retrieve that knowledge from anywhere at any time. Business decisions are only as good as the information on which they are based. Integrating all kind of collaboration capabilities into an enterprise portal together with business intelligence tools, we can build a powerful IT infrastructure for the collaborative enterprise. Abstract: In this paper the situation and the measures to be undertaken by developing countries to spread e-learning are discussed. Some of the sociological and political aspects of e-learning in different developing countries are studied, taking into consideration several differences in some of those countries. We then state the advantages of spreading e-learning in developing countries in general and give some recommendations. Abstract: Many processes in nature and technology can be described only by using laws and equations from different physical disciplines. Such examples, for which the arising sub-problems cannot be solved independently, are called multi-physics applications. A very important class of these multi-physics problems are the fluid-structureinteractions (FSI), which are characterized by the fact, that the flow around a body has a strong impact on the structure and/or on the movement of the body and the modification of the structure or the position of the body or a component of the body due to the flow has an influence on the flow which is not negligible. The two disciplines which are involved in this kind of multi-physics problems are the fluid dynamics and the structure dynamics which both can be described by the relations of continuum mechanics. Examples of FSI exist in many fields of the natural sciences and the technology. Solutions for the mathematical description of fluid structure interactions can be obtained only by numerical simulations, which still today are a big challenge of scientific computation. In this contribution initially the fundamental relations for the calculation of the flow behavior and of the structure dynamics will be presented and approaches for numerical solutions of coupled FSI-systems will be pointed out. Afterwards different kinds of coupling methods for the two disciplines and possible methods of partitioning of the numerical simulations are described in detail and evaluated regarding the dependence of the two disciplines from each other. A detailed discussion of solutions for several FSI-examples brings the contribution to conclusion. Abstract: In the framework of ordinary continuum thermodynamics turbulence models could be interpreted as constitutive equations which are necessary to close the equations of motion and the internal energy equation. The principle of Turbulent Frame Indifference is the equivalent in turbulence of the principle of Material Frame Indifference and implies form-invariance and frame indifference on the turbulent closure relations (Hutter & Joenk, 2004). Sadiki and Hutter (1996) emphasized that form-invariance and frame-independence are two distinct matters. A turbulent closure relation is form-invariant if it does not modify its formal expression under transformations of the frame and is constructed only with objective tensors. A turbulent closure relation is frame indifferent if it is expressed in terms of tensors that are independent of the angular and translational velocity of the frame. Weiss and Hutter (2003) emphasized the difference between the form-invariance and the frame indifference by underlining the existence of tensors that are objective but dependent on the angular velocity of the frame. A turbulent closure relation, which is expressed in terms of objective tensors that are dependent on the angular velocity of the frame, does not fulfil the principle of Turbulent Frame Indifference, because it is form invariant but frame dependent. Must all the turbulent closure relations fulfil the Principle of Turbulent Frame Indifference? The turbulent phenomena are not associated to the properties of the materials: consequently, turbulent closure relations do not represent the material behaviour. Turbulent closure relations must always be form invariant, but must not necessarily be frame indifferent (Hutter & Joenk, 2004). In other words not all the turbulent closure relations must fulfil the principle of Turbulent Frame Indifference. In the turbulent closure relations, the modelled expressions of an unknown objective tensor must be formulated in terms of objective tensors (allowing the closure relations to fulfil the requirement of form invariance) and must retain the same dependence (on the angular velocity of the frame) of the unknown tensor. As demonstrated by Gallerano et al. (2005), the generalised SGS turbulent stress tensor in LES is an objective tensor and is independent of the angular and translational velocity of the frame. Consequently, the closure relation for this tensor must fulfil the principle of Turbulent Frame Indifference. A new closure relation for the generalized SGS turbulent stress tensor is presented. In the proposed model the generalized SGS turbulent stress tensor is related to the generalized SGS turbulent kinetic energy and its viscous dissipation. It is demonstrated that the balance equation of the viscous dissipation is form-invariant but frame-dependent under Euclidean transformations of the frame; the proposed closure relations allow the modeled balance equation of the viscous dissipation to respect the properties of form-invariance and frame-dependence of the exact equation. Abstract: Geometric moire is classical full-field non-destructive optical experimental technique applied for measurement of in-plane fields of deformation and strain. It is based on subtractive superposition of moire gratings which are usually comprised from arrays of parallel lines. Patterns of moire fringes are produced when image of the grating in the state of equilibrium is superposed with another image of the deformed grating. What would happen if moire grating would oscillate and time averaging techniques would be used to form the image of the oscillating system? Would any time averaged fringes form at all? And if they would form how could they be interpreted? The presented study of applicability of geometric moire for dynamical systems answers to these basic questions. It is shown that time average geometric moire can be effectively applied for analysis of meso-, micro- and even nano-scale dynamical systems. Moreover, these techniques are developed for analysis of chaotic oscillations and generalised for stochastic systems and super moire applications. Abstract: The Self-Organizing Map (SOM) (also called Kohonen network) is an artificial unsupervised network characterized by the fact that its neighbouring neurons develop adaptively into specific detectors of different vector patterns. The neurons become specifically tuned to various classes of patterns through a competitive, unsupervised or self-organizing learning. Starting from the idea to consider the SOM as a cell characterizing a specific class only, Neagoe proposed and evaluated in ,  a new neural recognition model called Concurrent Self-Organizing Maps (CSOM), representing a collection of small SOMs, which use a global winner-takes-all strategy. Each SOM is used to correctly classify the patterns of one class only and the number of networks equals the number of classes. The CSOM is a system of systems. The model proved to have better performances than SOM, both for the recognition rate and also for reduction of the training time. Abstract: With operating frequencies reaching the multi-GHz range, the role of on-chip inductance is becoming increasingly important. The role of inductance in the interconnect model is particularly significant in clock distribution networks and in signal and power lines, which have wide wires and hence low resistance. The detrimental effects of inductive impedance on system performance include increase in signal delay times and signal overshoot which can cause breakdown of the gate-oxide layer. As a result, accurate modeling and extraction of inductance have become necessary. Over the past few years, we have been working on the development of a stochastic solution methodology for the extraction of inductance in interconnect structures. Stochastic solution methods do not require the discretization of either the volume or the surface of problem domains. As a result memory requirements are low compared to discretization-based deterministic methods such as the finite difference, the finite element or the method of moments. Another advantage of stochastic solution methods is that an almost linear rate of parallelization is obtained for a very large number of processors. In this lecture, I will talk about some very exciting results that we have obtained and future research directions. Abstract: We propose an innovative method of multiple access, known as Frequency Bank Signal (FBS). FBS combines the phase shift compensation method used in the PAL-TV system, the OFDMA principle and the spread spectrum concept with Walsh functions. The main advantage of using FBS is that the error probability is almost non-sensitive to the Doppler Effect, separate signals delay and to the influence of fading. In addition, FBS does not require any special pilot, synchronization or equalization signals. Our simulation results show that the FBS has superior performance over OFDM under similar conditions. The proposed method can be implemented in all modern wireless communication systems. Abstract: RoF(Radio on Fiber) is a promising technology for mobile communication systems. By using the RoF technology, wireless signal is transmitted through the optical fiber directly. Transceivers can be equipped in the switching station side and base stations are composed of only O/E transducer, amplifier and antenna. Thus the RoF technology reduces the size of base station remarkably. This compact base station is very important for future mobile communication systems because a huge number of micro-cell base station must be equipped to provide higher capacity and higher bit rate services. 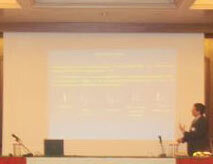 The presentation introduces recent RoF technology for indoor cellular systems. 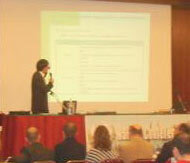 New research for RoF technology is also presented. Base station electrical power is supplied through the fiber by sending strong optical power. The feature is that the base station becomes more compact and easier to install everywhere by eliminating the power supply. The Coffee, Tea, Sweets, Cakes, Pastries were available for the Guests during the coffee-breaks. Really, the WSEAS Conferences in Venezia were superb with great participation (more than 450 colleagues passed from the Secretariat Desk). The Entertainment Program of the Banquet in November 21 was from 21:00 o'clock until 24:00 There, we had the pleasure to enjoy a typical Venezian Show called "Lezioni di Minuetto" that the Organizers arranged specially for the WSEAS attendees. During the banquet, the participants were taught the so-called Minuet lessons: A group of professional dancers in period costume and a Master of Ceremonies will give a demonstration of the dances typical of Venetian parties during the 18th century and later involved the guests, teaching them the fundamental steps to the notes of Boccherini's famous Minuet. The genuine Venetian artists took us back using their magic "machine of time" to the 14th and 15th century using music, dance and dressing from the Dogis' Era ( Dogis were the Leaders the of the Venezian Empire which was a Naval Empire that controlled almost all the mediterranean sea with the Venice as its Center). with many attractions, country music, singers and american dance (see the photos above). took place before and after the WSEAS Conferences.